East 7th Street, between First and Second Avenues in 1841 was a well-to-do neighborhood. 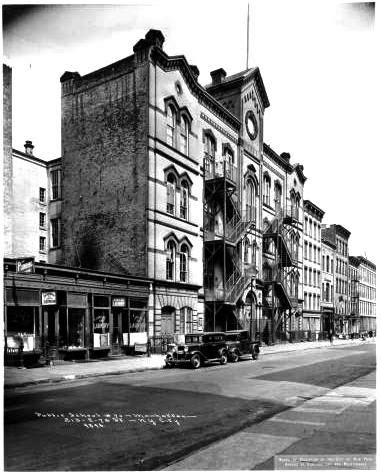 Just blocks from the exclusive Astor Place and Bond Street areas, 7th Street was filling with comfortable brick homes of the merchant class. Among them was No. 81 East 7th Street, constructed about this time. The four-story and basement house was designed in the popular Greek Revival style and its orange brick contrasted nicely with the brownstone of the trim and rusticated basement. It was owned by the Merchant Marine Insurance Company in 1843 and valued at the time at $4,000—around $122,000 in today’s dollars. The neighborhood around the home changed by mid-century as immigrants flooded into New York harbor and settled in the Lower East Side. The Revolutions of 1848 in the Germany states forced many to leave their homeland and seek new lives in America. By 1855 New York had the third largest German population in the world. And by the end of the Civil War many of the homes in the neighborhood had been converted to rooming houses. The owner of No. 81 hung on, however; and with the introduction of the neo-Grec style in the 1870s, the outdated house got a makeover. The style sought to mimic the buildings of the early Greeks and manifested itself at No. 81 East 7th Street with sharp, molded pediments over the parlor level openings, imposing enframents upholding ambitious lintels and a handsome cornice with rosette-adorned brackets. The house which had been rather unremarkable suddenly became anything but. In the late 1880s it was home to the widowed Pauline Lowenthal. In 1889 the East Side Ladies’ Aid Society for Widows and Orphans was incorporated and Pauline was elected Vice President. The aim of the society was “To assist the worthy poor by means of food, coal, clothing and money in necessitious cases.” The group relied on voluntary contributions and in 1891 had assisted 100 widows and 150 orphans. Pauline was still in the house in 1892; however the end of the line as a single-family home was drawing near. By 1902 the house had been converted to a multiple-family dwelling. It was most likely at this time that the updated Beaux Arts entrance doors were installed. Among those living in the house in 1911 was the Hungarian-born Dr. Arthur Kozma, who had studied at the Royal University of Budapest. Kozma would remain in the house for years and became active in local politics. In 1914 Kozma was the Progressive leader of the Sixth Assembly District and Chairman of the New York County Committee of the American Party. But on October 27 that year he abruptly resigned his chairmanship when he discovered shady activities within the Committee. The New York Times reported “Dr. Kozma said he had been led to believe that negotiations were under way to throw support of the American Party to District Attorney Whitman.” The Committee had decided to consider making Whitman its new favorite after he promised to contribute $10,000 to the American Party. Kozma wanted no part of it. As World War I raged in Europe, Americans of Hungarian, Austrian and German birth were viewed with grave suspicion. Dr. Kozma was one of the speakers on January 30, 1916 at “A great mass meeting of American citizens of Hungarian birth…in the Garden Theatre at Madison Avenue and Twenty-seventh Street in which the persons present pledged unfailing loyalty to the country of their adoption and protested against insinuations that, as hyphenated Americans, they were not good citizens,” as reported by The New York Times the following day. The great bulk of German residents had begun moving out of the neighborhood around the turn of the century; a trend that was hastened by the disastrous sinking of the General Slocum riverboat that ended in the deaths of nearly 1,300 women and children. Remaining in the familiar Lower East Side neighborhood was too painful for the surviving families. By 1921 the basement had been converted to Schwartz’s Restaurant. In April that year 24-year old Roberto Raffaele arrived in New York from Camp Jackson, South Carolina. Although Raffaele was trained as a piano tuner, his failing eyesight due to severe cataracts prevented him from continuing that profession and he found employment at Schwartz’s as a dishwasher. The work earned him $1.50 a day plus meals. Things would soon turn bad for Raffaele. On May 24, 1921 five year-old Guiseppe Varotta was playing in front of his home at No. 354 East 13th Street. The boy was snatched by kidnappers who vanished with him. A week later, on June 1, Raffaele sat on a park bench in Union Square when he was approached by a man named Ruggiero. The man could tell by Raffaele’s clothing that he had little money and struck up a conversation that included questions about his financial condition. Raffaele later testified that he told Ruggiero that he was “almost penniless.” Finally Ruggerio got to the point. With the promise of $50, Raffaele agreed to deliver a ransom note to the Varotta home. It ended tragically for everyone involved. When the Varotta family could not come up with ransom money, little Guiseppe was drowned in the Hudson River. Although Roberto Raffaele insisted that he had no part in the kidnapping nor the murder, he was sentenced to death on August 23, 1921. 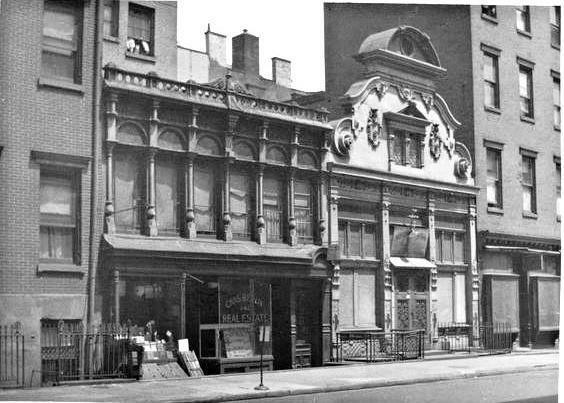 By 1925 Schwartz’s Restaurant was gone and the space was taken over by the Jewish Actor’s Club. In the meantime the upper floors continued to be rented as apartments. Like nearly all tenements the rooms were often overcrowded. In 1929 not only did 63-year old Charles Hollandell and his wife Bessie live in one of the apartments, so did their four adult children. Charles Hollandell threw himself from a rear window and died instantly. Firemen pulled one woman and a small boy out of the burning building, both of whom died on the sidewalk soon after. “The firemen had great difficulty in restraining excited women from jumping, and several were badly burned before they could be carried to safety,” said The Times. The rest of the Hollandell family, including 62-year old Bessie, were rescued and removed to Bellevue Hospital for treatment of their burns. The scene was chaotic. In the end, in addition to the three fatalities, at least 10 residents were taken to the hospital. The fire damage was repaired and the unusual-looking house resumed its role as home to multiple families. By the second half of the century the neighborhood had changed once again—now the center of the Ukrainian community. In the 1980s the basement space once home to Schwartz’s Restaurant was The Verkhovyna, a Ukrainian bar. The East Village neighborhood was also by now populated by artists and musicians and had taken on its own avant garde personality. It was the sort of neighborhood that Elizabeth Benjamin did not want to give up in 2006. But when she failed to pay 27 months of rent at No. 81 East 7th Street (at $227 per month), the owner attempted eviction. In October 2009, when she failed to provide the $6,129 in back rent demanded by the courts; she was evicted. But Benjamin had a plan. She represented herself before the judge saying that she was insane and therefore could not be evicted because of medical reasons. When she was unable to provide documents proving her psychological or psychiatric condition, her ploy failed. Today the English basement remains home to a café/bar. The upper stories are remarkably intact despite replacement windows above the parlor level and an industrial looking fire escape. As they initially did, the striking neo-Grec alteration upgrades draw a second glance from passersby. 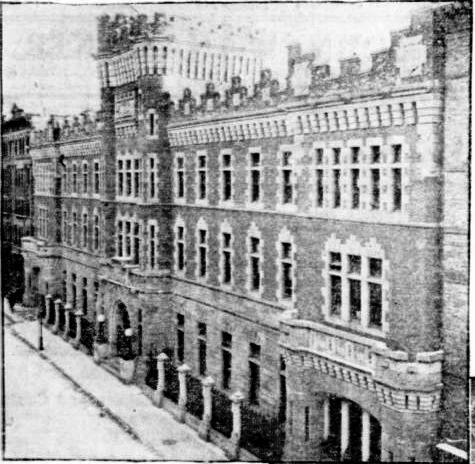 The 1904 First Battery Armory -- No. 56 West 66th St. In 1881 command of the National Guard’s First Battery was given to Captain Louis Wendel. Since the unit’s organization from Civil War veterans in 1867 (then known as Battery K), it had had only one commander, a Captain Heubner. Now the First Battery moved to headquarters at No. 334-346 West 44th Street, over Captain Wendel’s saloon. Running a National Guard unit from above a barroom would have been both inappropriate and humiliating, and it appears it was Captain Louis Wendel who most vigorously pushed for a suitable armory. Finally, on January 17, 1900 the New-York Tribune reported that the Armory Board had received $115,681.15 from the Mayor’s office for the land needed for the First Battery Armory. The plot was located on West 66th Street and Central Park West. With the bank playing “Nearer, My God, to Thee,” Guggenheimer smoothed the mortar with a silver trowel, then dropped coins and other mementos into the cornerstone. A derrick lifted the heavy stone into place as the band struck up the National Anthem. The second floor contained locker rooms, commissioned officers’ rooms, a gymnasium and a kitchen. The third floor was dedicated to Captain Wendel’s apartment, his clerk’s apartment and a janitor’s apartment. Finally, on February 3, 1904 the new Mayor turned over the gold key to the armory to Captain Wendel. Horgan & Slattery’s exterior design was as much about function as it was romantic medieval fantasy. At 175-feet wide, it reproduced a crenulated fortress with turrets, loop holes, sally ports and other elements necessary to defend the unit from siege. The final cost of the armory--$125,000 for the land and $118,000 for the structure—would equate to about $6.7 million in 2015. Instead of military sieges, the new armory quickly became the scene of sporting and social events. Just three weeks after the unit moved in a most unusual demonstration took place. 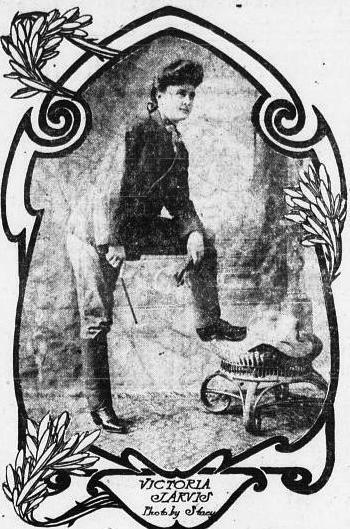 On February 25, 1904 The Evening World reported that a young woman from Brooklyn, Victoria Jarvis, had accepted the challenge to ride a bucking bronco here. One wonders if the Brooklyn girl truly understood the differences between East Coast horses and wild West bucking broncos. Sadly, we may never know, as newspapers failed to follow-up on the story. Expense was incurred in the elaborate, variegated brickwork. While the ugly court case continued, the 61st Street armory added another unit, the First Field Hospital. But, as had been the case during the Spanish-American War when Wendel offered the First Battery’s service and was denied; the members would see World War I come and go without seeing action. A far less violent event was the Open Exhibition of Colorful Tropical Birds and Canary Types which opened on December 3, 1949. By now military activity in the armory was nearly non-existent. Finally in 1976 the building was decommissioned and renovated by the architectural firm Kohn Pederson Fox for use as ABC television studios. In 2003 ABC Television Network commissioned architect Cosmo Veneziale to restore the façade and create appropriate replacement windows. The romantic fortress, with its history of corruption, scandal and tepid function as a military facility, stands as a colorful side note in the history of the Upper West Side.